Need Cliff Notes to stay on top of news stories? The Circa News iPhone and iPad app sifts through all of the details and presents the most important ones with clarity and precision in a neat, intuitive interface. As the story inevitably develops, the Circa News iPhone app editors continually update them with pertinent information. 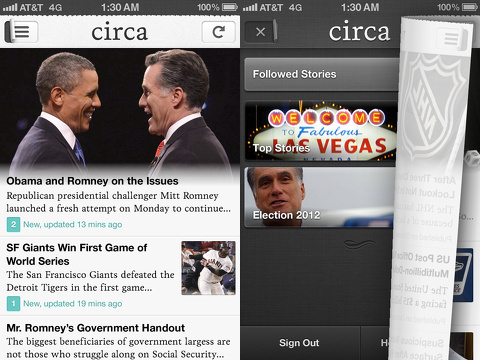 To get started with the Circa News iPhone app, you must authorize Facebook or create an email log-in. 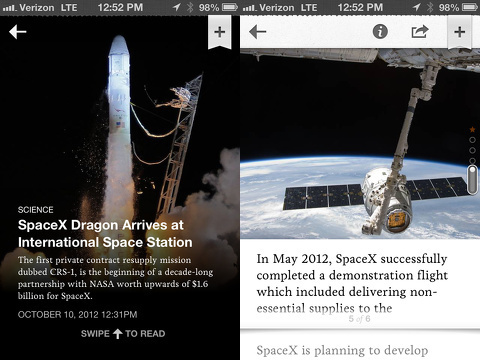 The home screen has two different views for exploring the featured news stories. You move between the two views by pressing the lined icon in the top left hand corner of the screen, or you can swipe your finger from the lower left hand corner to the upper right hand corner. This gesture control is an interesting touch, as the list view flicks like a page of newspaper to reveal the second view. The first view when you open the Circa News iPhone app is a list view of the most recently updated stories. The simple display includes a headline, date, and photo for each. The second view is a category view. You can choose to access a list of stories you follow, top, US, politics, and world. When you find an interesting news story, you tap it and a new interface is revealed. The content could be a simple list of facts, short paragraph, photo, map, quotes, or any other relevant way of distilling a story. For each item of content, it has its own screen that is accessed by vertical finger swipes. You can monitor how many screens of content are available by watching the movement through the highlighted circles on the right side of the screen. Another great feature of each snippet of information is the inclusion of an article that provides greater detail and fleshes out the snippet. At the top of the news story screen, you will find an excellent menu bar with additional features. A touch on the information icon makes a pop-up with links to the source information. The share icon leads to a two-step process of sharing. First, you choose to share the bullet point or the entire story. Then, you may share to Twitter and Facebook with your personal note. The final menu bar option is the ability to follow a story. Your followed stories can be accessed in the category view mentioned earlier. The Circa News iPhone and iPod Touch app is well-designed and has a fresh way of presenting content. It certainly addresses the challenge of staying on top of new and developing details. The ability to go straight to more thorough sources of information certainly increases engagement. It’s a solid choice to turn to, when you need just the facts. AppSafari review of Circa News was written by Jenni Ward on January 4th, 2013 and categorized under App Store, Free, News, Reference. Page viewed 4172 times, 2 so far today. Need help on using these apps? Please read the Help Page.